It seems fair to say that certain activates are often more appealing to a certain gender. For example, many women would throw at the idea of spending a day at the soccer followed by getting drunk at the bar. On other hand, the average male wouldn’t necessarily imagine a day out shopping followed by spa treatments as the perfect activity to enjoy. However, gaming is one such activity that has evolved immensely over the last decade. Once upon a time it was something that adults rarely got involved with; it was more of a children’s enjoyment. Things certainly appear to be much different today. Many imagine gamers to be mainly men, yet research suggests that this isn’t true. Women and males are both more-or-less equally take part, according to research. There are many reasons for this change in demographic appeal. One such reason is the smartphone and tablet, both of which provide access to a huge variety of causal games. From Angry Birds to Super Mario Run – these games have opened an entire new catalogue of games that are highly attracted to by women. Of course, men are more likely to gravitate towards adrenaline pumping games that include first-person-shooters and soccer. The internet has also allowed for us to communicate and socialise by engaging in such technology. Social media is highly integrated into causal games, allowing players to challenge their friends and family members. What’s more, these simple games are often very enjoyable. Recently, .IO games have become popular amongst causal games and It seems fair to say that playing io games can be addictive. They can be found on portals such as Poki.com, which provides a huge amount of freely available games that can be played via a web-browser or smartphone. Online broadcasting websites have seen a huge increase with women casters. Twitch.tv is one of the reasons for this, it has established a video community that allows fans to communicate via chat box with the broadcaster. A select number of users are even making a living due to the vast number of viewers they are able to attract to their channel. Modern gaming consoles are also opening new areas to gaming as never witnessed before. Virtual reality is a recent newcomer to the tech scene that has wowed many. Then there is the PlayStation 4 gaming console by Sony, which has attracted a huge following. Nintendo’s recent launch of the Switch also offers something different and less-typical with colourful and cheerful games that are made primarily for fun alone. So, we have established that gamers are far more diverse than ever before. 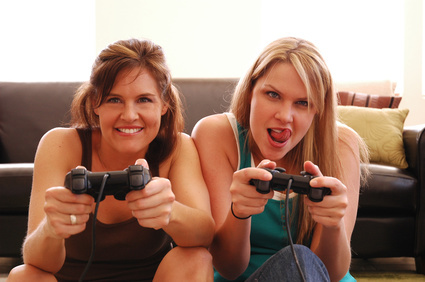 Whilst the type of game or system played by a gender is more likely to be opposites, the fact remains that gaming is enjoyed fairly amongst males and females. Interestingly, older people would often avoid video games, but are now also taking up this very hobby – partly due to the same reasons mentioned already within this article. One upon a time older people might have considered a good old crossword as a bedtime ritual, yet the same can now be enjoyed from the comfort of a tablet computer. Sadly, many games don’t feature female characters, and this could partly be blamed on game developers and their possible naivety towards who their audience and fans actually are. Although, this does appear to be changing, especially with causal games. Are you a gamer girl? If so, be sure to leave your comments below and let us know your thoughts on this subject.